Are you pondering about where to spend New Years? Are you looking for a Dream Destination? If you are thinking about where to travel for Christmas and New Years vacation during the fall season, it’s the perfect time to Plan A Morocco Tour. A Morocco Dream Vacation in the great Sahara Desert under the Moroccan stars is should be on everyone’s bucket list. Morocco travel offers affordable airfare, reasonably priced Tailor Made Tours, stays at boutique riads and hotels and visits to Heritage Sites, Andalusian Gardens, Kasbahs, the High Atlas along with the opportunity of wide range of adventure activities. One of the best ways to spend a Morocco Dream vacation is in the desert on a Sahara Desert Safari Tour that takes you through Marrakech and the Great South. A Sahara Desert Safari Tour includes stays at Moroccan Riads (restored luxurious large home or Moroccan style palace with guest rooms centered around a courtyard, gardens and fountains) and Guest Houses along with an overnight stay in a Luxury Desert Camp. Whether you are a traveler on a budget or want a luxury Morocco travel experience, a Morocco Dream Vacation is a feasible option. A Morocco Dream Vacation also lends an opportunity to expand your cultural horizon. Private tour options including visiting Morocco with licensed historical guides who are experts in their fields. During the holiday season of Christmas and New Years a Morocco Dream Vacation is the perfect escape and one that will guarantee the experience of a lifetime. If you are a traveler who has imagined a Morocco Dream Vacation, now is the time to consider spending Christmas and New Years in Morocco’s Imperial Cities and the South. What ever you fancy as a Dream Vacation, Marrakech is a great starting point and offers a delight of Moroccan sites, eats, scenery, monuments, music and shopping for the American holiday season. Don’t hesitate, whether you are on a budget or desire luxury travel, Book a Private Tour to Marrakech, Morocco for Christmas & New Years today. 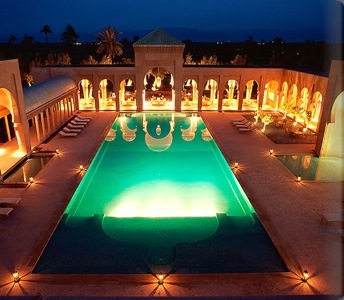 You are currently browsing the archives for the Marrakech Morocco Tours category.